The efficient provisioning of complex applications is one of the most challenging issues in Cloud Computing. Therefore, various provisioning and configuration management technologies have been developed that can be categorized as follows: imperative approaches enable a precise specification of the low-level tasks to be executed whereas declarative approaches focus on describing the desired goals and constraints. Since complex applications employ a plethora of heterogeneous components that must be wired and configured, typically multiple of these technologies have to be integrated to automate the entire provisioning process. In a former work, we presented a workflow modelling concept that enables the seamless integration of imperative and declarative technologies. 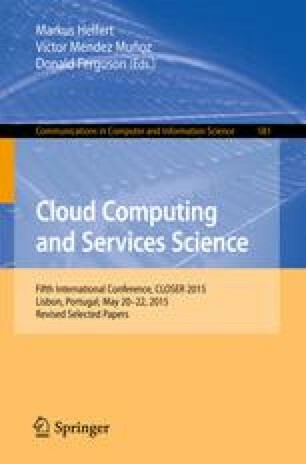 This paper is an extension of that work to integrate the modelling concept with the Cloud standard TOSCA. In particular, we show how Hybrid Provisioning Plans can be created that retrieve all required information about the desired provisioning directly from the corresponding TOSCA model. We validate the practical feasibility of the concept by extending the OpenTOSCA runtime environment and the workflow language BPEL. This work was partially funded by the projects SitOPT (Research Grant 610872, DFG) and NEMAR (Research Grant 03ET40188, BMWi).